LAHORE: Security and intelligence agencies have arrested five suspected terrorists involved in carrying out deadly twin suicide blasts at Catholic and Christ Churches in Youhanabad area of Lahore in May this year. Weapons, explosive material and detonators were also recovered from the suspected terrorists, sources told Geo News on Friday. 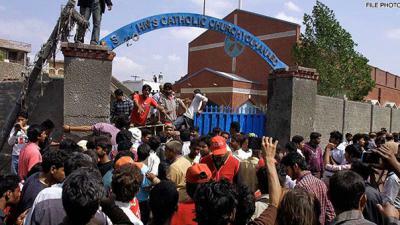 According to the sources, the arrested suspects facilitated the suicide bombers in carrying out the deadly terrorist attack, which claimed 15 lives and prompted violent protests by the Christian community in different parts of the country.